What and Where is Sunset Celebration? 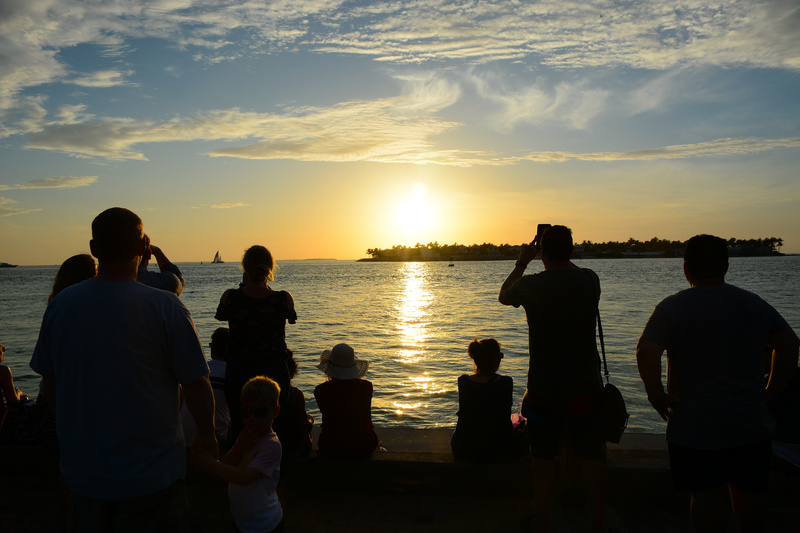 Mallory Square sits at the northern end of Duval Street and looks out on the beautiful waters of the Gulf of Mexico and sits adjacent to the cruise ship port and Key West's Old Town. Sunset Celebration is a nightly arts festival at Mallory Square, where hundreds come every night to mark the passing of yet another day in paradise. Folks usually start arriving about 2 hours before the official sunset. Though the cruise ships do dock right next door, since 1984 they have been required to leave port at least 2 hours prior to the sunset and may then return again, if they are spending the night. The nightly festival hosts visitors from all over the world who come to take part in the magicians, jugglers, clowns, psychics, local musicians, artists, and food vendors that combine for an incredible cultural experience. In addition to it's names sake appeal, the area is also home to the Memorial Sculpture Garden. Here you'll find bronze busts of 39 men and women that have had a significant impact on the islands life and heritage. The artist responsible for the sculptures as well as the 20 foot monument at the entrance, is James Mastin. Additionally, you'll find the Key West Shipwreck Historeum / Museum, the Old Post Office & Customs House (which serves as the Key West Museum and Art & History), the oldest attraction on Key West the Aquarium, as well as a number of fantastic restaurants.